This article was first published on World Resources Institute website on 16 January 2018. Click here to read the original article. 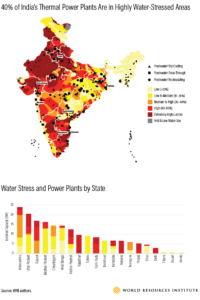 New WRI research finds that 40% of the country’s thermal power plants are located in areas facing high water stress, a problem since these plants use water for cooling. 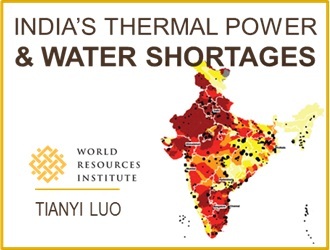 Scarce water is already hampering electricity generation in these regions—14 of India’s 20 largest thermal utilities experienced at least one shutdown due to water shortages between 2013-2016, costing the companies $1.4bn. 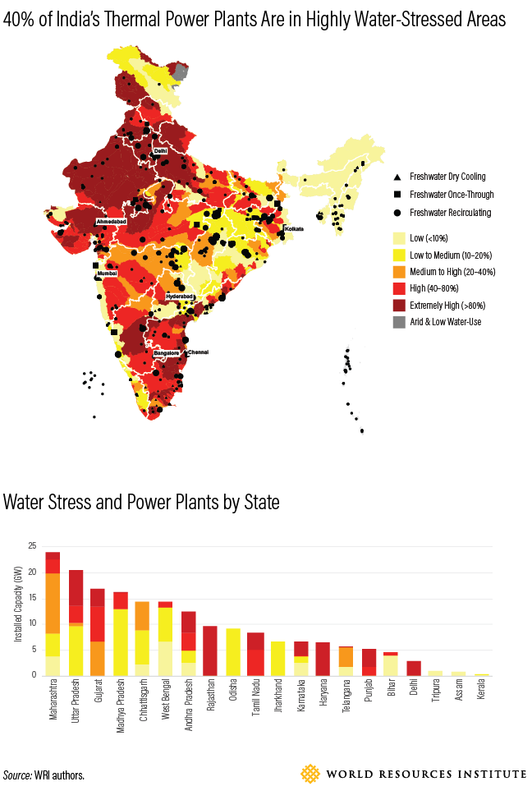 It’s an issue that’s only poised to worsen unless the country takes action—70% of India’s thermal power plants will face high water stress by 2030 thanks to climate change and increased demands from other sectors. 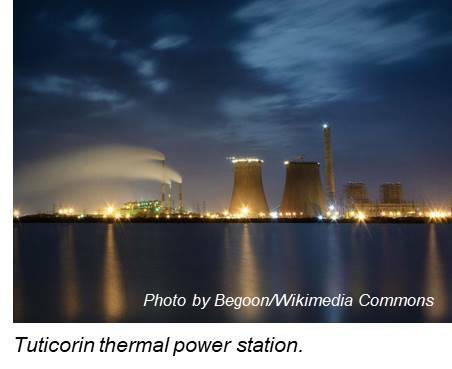 Thermal power—power that relies on fuels like coal, natural gas and nuclear energy —provides India with 83% of its total electricity. While these power plants fail to disclose how much water they’re using in their operations, WRI developed a new methodology using satellite images and other data to calculate their water use. Much of the water withdrawn by power plants is returned to the lakes and ponds from which it came, but a lot is also consumed, and not returned to its original source. 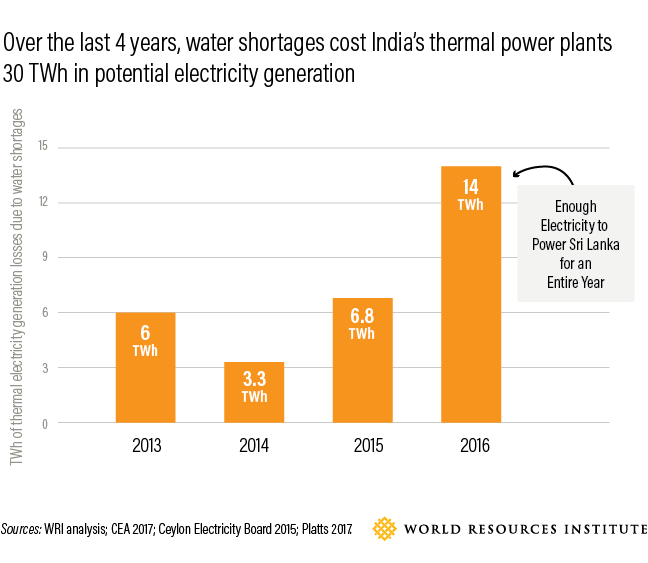 We found that almost 90% of India’s thermal power generation depends on freshwater for cooling, and the industry is only growing thirstier. 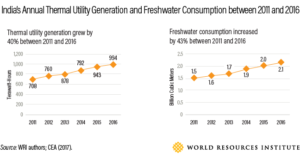 Thanks to increased energy demand and the growing popularity of freshwater-recirculating plants, which consume the most water of any thermal plant, freshwater consumption from Indian thermal utilities grew by 43% from 2011-2016, from 1.5 to 2.1bn m³ a year. To put this in perspective, India’s total domestic water consumption in 2010 was about 7.5bn m³, according to the Aqueduct Global Water Risk Atlas. That means power plants drank about 20% as much water as India’s 1.3bn citizens use for washing dishes, bathing, drinking and more. More than a third of India’s freshwater-dependent plants are located in areas of high or extremely high water stress. These plants have, on average, a 21% lower utilisation rate than their counterparts located in low or medium water-stress regions—lack of water simply prevents them from running at full capacity. Even when controlling the comparison analysis by unit age, fuel type and plant capacity, the observation was always the same: Plants in low- and medium-stress areas are more able to realise their power output potential than those in high water-stress areas. There are practical and financial implications of power plants’ thirst. Between 2013 and 2016, India’s thermal plants failed to meet their daily electricity generation targets 61% of the time due to forced power plant outages. The reasons ranged from equipment failure to fuel shortages. Water shortages were the fifth largest reason for all forced outages—the largest environmental reason. 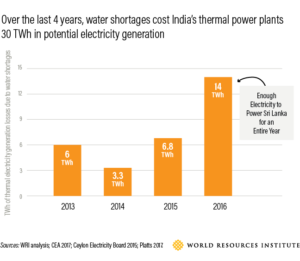 In 2016 alone, water shortages cost India about 14 terawatt-hours of potential thermal power generation, cancelling out more than 20% of the growth in the country’s total electricity generation from 2015. 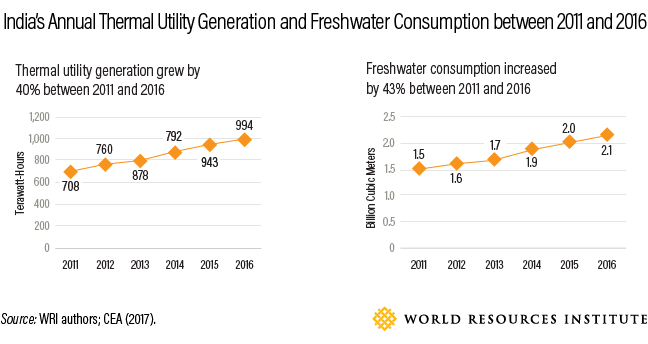 As India develops, water competition will continue to grow and climate change will likely disrupt reliable water supply. Thermal utilities will become even more vulnerable to water shortages, power outages and lost revenue. It’s worth noting that the government of India already has plans in place that give a reason for hope, such as the notification on power plant water withdrawal limits and the “40/60” renewable energy development plan. If these ambitious policies are enacted and enforced, our estimates show that India will save 12.4bn m³ of freshwater from being withdrawn by power plants. That’s a year’s worth of showers for 120mn people – more than live in the Philippines. Tianyi is a Research Assistant in the Markets & Enterprise Program. He works on Aqueduct framework application, water-energy nexus analysis, and map generation and design. Tianyi also assists in Aqueduct tool development and database management. Prior to joining WRI, Tianyi worked as a research assistant developing satellite based model for evapotranspiration estimation, and supporting the work of water diplomacy and global cholera outbreak database. He also interned at HUISHANG GROUP in China assisting construction supervision and engineering design evaluation. Tianyi holds a M.S. in environmental and water resources engineering from Tufts University, and a B.E. in water supply and drainage engineering from Hefei University of Technology in China. Tianyi enjoys playing basketball in Virginia Highlands Park and painting in his apartment in Pentagon City.